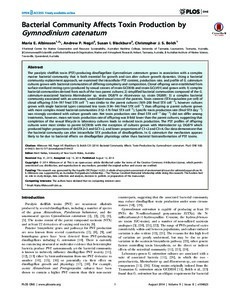 Copyright 2014 The Authors-This is an open-access article distributed under the Creative Commons Attribution 4.0 International (CC BY 4.0) license. The paralytic shellfish toxin (PST)-producing dinoflagellate Gymnodinium catenatum grows in association with a complex marine bacterial community that is both essential for growth and can alter culture growth dynamics. Using a bacterial community replacement approach, we examined the intracellular PST content, production rate, and profile of G. catenatum cultures grown with bacterial communities of differing complexity and composition. Clonal offspring were established from surface-sterilized resting cysts (produced by sexual crosses of strain GCDE06 and strain GCLV01) and grown with: 1) complex bacterial communities derived from each of the two parent cultures; 2) simplified bacterial communities composed of the G. catenatum-associated bacteria Marinobacter sp. strain DG879 or Alcanivorax sp. strain DG881; 3) a complex bacterial community associated with an untreated, unsterilized sexual cross of the parents. Toxin content (STX-equivalent per cell) of clonal offspring (134�7 fmol STX cell−1) was similar to the parent cultures (169�6 fmol STX cell−1), however cultures grown with single bacterial types contained less toxin (134�6 fmol STX cell−1) than offspring or parent cultures grown with more complex mixed bacterial communities (152�6 fmol STX cell−1). Specific toxin production rate (fmol STX day−1) was strongly correlated with culture growth rate. Net toxin production rate (fmol STX cell−1 day−1) did not differ among treatments, however, mean net toxin production rate of offspring was 8-fold lower than the parent cultures, suggesting that completion of the sexual lifecycle in laboratory cultures leads to reduced toxin production. The PST profiles of offspring cultures were most similar to parent GCDE06 with the exception of cultures grown with Marinobacter sp. DG879 which produced higher proportions of dcGTX2+3 and GC1+2, and lower proportions of C1+2 and C3+4. Our data demonstrate that the bacterial community can alter intracellular STX production of dinoflagellates. In G. catenatum the mechanism appears likely to be due to bacterial effects on dinoflagellate physiology rather than bacterial biotransformation of PST toxins.